History: Dash’s entire racing career was spent at Derby Lane, where he ran 59 races (according to Greyhound Data) or 69 races (according to Track Info.). From his first race on August 3, 2010, he rose steadily through the grades to Grade A and Stakes. He retired as a Grade A racer on November 22, 2011. Dash’s second career was that of stud. He sired one litter of 7 pups with Backwood Jodie. One of Dash’s offspring, Backwood Taylor (now Haven), was also a TAGS adoptee. That litter was whelped in November, 2012. Dash has a sterling pedigree (dam, Backwood Stepper from the Oshkosh Slammer line and sire, Dodgem By Design from the Gable Dodge line). TAGS’ Backwood Cody (now Chief) is one of Dash’s littermates. Dash is ready to continue his third career – that of a spoiled couch potato. 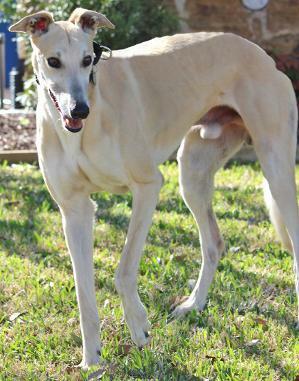 Dash has a very friendly, outgoing personality. 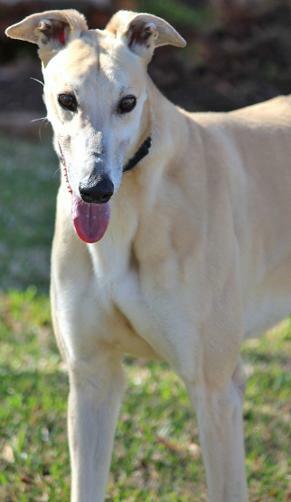 He is an easy going boy and should have to problem finding his forever home. Dash (left) and Becca (now Annie) (center on blue bed)found their forever home with the Thomas family, including TAGS' alumni, Hildy and Luke. What a happy family. May 21, 2016 update: Dash found his forever home with Becca and the Thomas family, including TAGS' alumni, Hildy and Luke. April 5, 2016 update: After almost two years in a home as a single pet, Dash’s adopted dad was promoted to a position where he travels constantly. There was no one to keep Dash while his person traveled so he was returned to TAGS to continue his search for a forever home. Having been loved as a wonderful house pet he should have no problem fitting into another home as either a single dog or with other dogs and cats. April 24, 2014 update: Shyster went to his loving forever home. Congrats to Shyster and his new dad. 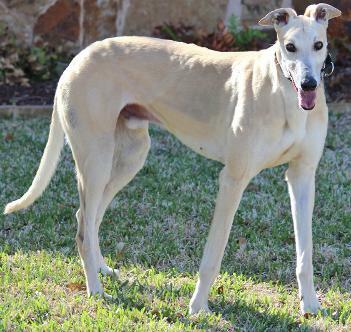 April 8, 2014 update: Shyster came to TAGS for a life of retirement and to find his loving lifetime home.